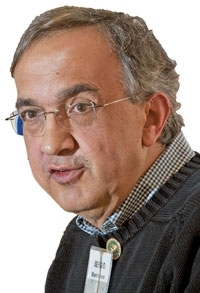 "I have never lived through a period with this level of complexity and this level of optionality," said Fiat-Chrysler CEO Sergio Marchionne about the current state of affairs at the Italian-American automaker. Fiat-Chrysler CEO Sergio Marchionne remains convinced that the only way for an automaker to survive in the 21st century is to get bigger and work smarter. He is logging 16-hour workdays to achieve both at the Italian-American giant. He says the integration of the automakers is at point when mistakes could have huge long-term ramifications. The 59-year-old executive explained why during an interview in his Turin office with Automotive News Europe Chief Correspondent Luca Ciferri. Three years ago, you predicted the financial crisis would leave the world with six surviving global automakers and each would be building at least 6 million units a year. Since then, Fiat-Chrysler is the only major consolidation. What happened? Give it time. I have not changed the sense of my prediction. Hopefully it will happen on my watch. But more important than the absolute number of cars, is the volume produced per architecture. Given the level of investment it takes to develop a mass platform, a minimum volume of at least a million vehicles is needed to achieve an adequate return. By 2014, we expect Fiat-Chrysler to reach 5.9 million units and we will have just three main architectures that drive more than 80 percent of that total volume. You said you would run Fiat-Chrysler until 2015 or 2016. Was that a joke? I have two obligations here. The first one is to make this run and run well. The other one is to worry about the guy who runs it after me. The GEC [Fiat-Chrysler's global executive committee] was designed as the breeding ground for my successor. It's highly unlikely that my successor will come out of anywhere but that place. Who are your potential successors? Most likely he will come from the GEC. But that doesn't mean all the guys on the GEC today will make it in terms of the run. More importantly, [Fiat-Chrysler] is an incomplete piece of work and I acknowledge it. It is truly not ready to be handed over to somebody else. What is really crucial right now? This is the most sensitive period of the nearly eight years that I have been at Fiat. I have never lived through a period with this level of complexity and this level of optionality. It is too large. It won't take long, but we need to execute on those options pretty rigorously. So I would feel very, very uncomfortable leaving in this state. In percentage terms, where is the Fiat-Chrysler integration now? If the integration pace was just 5 percent a year then you would need until 2027 to finish. We are moving at the speed of light, this number could be 50 percent in 12 months. The speed of this thing is a lot faster because of all the time that I spent in the U.S. since 2009. It has really effectively set the stage for the integration, and these guys on the European side were already sort of waiting for it, and the Latin Americans we know well so it is easier to make the connections work now. You just need to be absolutely focused on execution of the integration. Your plans called for a combined 4.5 million Fiat-Chrysler sales this year. Will you make it? We will make around 2 million for Chrysler. The number for Fiat will be about 2.1 million, or just shy. I think we could possibly hit 4.2 million combined this year. What volume do you have in mind for next year? For Chrysler, we have announced 2.4 million and that number is unchanged. It's difficult to give a clear number for Fiat given the unpredictability of the European market, but we may be between 100,000 and 150,000 cars short of the original target [of 2.7 million units]. Why will Alfa and Jeep become Fiat-Chrysler's global brands? With all due respect to our two corporate names [Fiat and Chrysler], we have two brands – Alfa Romeo and Jeep – that have both the DNA and the history capable of international recognition and we need to play them. We need to continue to globalize Jeep and Alfa, so the development of architectures and engines that are designed to support these two brands is crucial, and everything else becomes almost secondary. How will you position the Alfa brand in the future? We are going to target the U.S. market first and work our way back into Europe. It is fair to say that we are going to be selling at a price at some X-minus against the German competitors. Whatever that minus is, it's going to be an X-minus as an introductory step, not because the cars are not competitive, but because we recognize our starting position in the food chain. Hopefully that positioning will change quickly as we roll out products. Will Fiat remain a full-line player only in Europe and Latin America and elsewhere it will play with a family of models based on the 500 minicar, like Mini is for BMW? It is quite possible that the globalization of Fiat as a brand is going to be limited. First, the Fiat 500 is a brand within a brand and so it is capable of expansion and declination in a way that effectively doesn't have to be associated with the rest of the Fiat offering elsewhere. Secondly, we have realized that the appeal of Fiat as an international brand, given the way in which the markets have evolved, is limited. It would be very, very foolish for us to try and continue to promote Fiat as being the introductory piece of our international expansion. Jeep and Alfa are the only ones that have the right to play in that box. In Europe and the United States the 500's extended family will include a small minivan code-named L0. Will you use 500 in the name of the car and call it the 500Plus or 500Mega? I don't know about the names. Certainly it is going to be linked, because we designed them to, effectively, be part of a family. I also think that we need to preserve the pricing and premium-ness of the 500 family. The Punto never had the 500's DNA and it never will. We will continue to develop the 500 nomenclature beyond the 500 today, but we need to be careful that we don't abuse the 500 in that process. The over-zealousness to stick the  label on the next vehicle that comes out of Fiat might just kill us. Could Fiat's small SUV become part of the 500 family? We need to agree on terminology. There is one SUV brand in this house and that domain belongs exclusively to Jeep. Everything else is at best a CUV [crossover-utility-vehicle] and it will never, ever have the SUV capabilities of a Jeep. Could Fiat's small CUV join the 500 family? Undecided. The styling I have seen so far is capable of that, but my instinctive reaction is that we will deviate from the 500 structure and go back to a traditional Fiat nomenclature. Therefore, it will be limited to Europe. Could you elaborate on the architecture for the Alfa Romeo, Fiat and Jeep brand models to be built in your Mirafiori plant? It is an evolution of the Small Wide architecture we created for building the L0s in Serbia. Small Wide has been U.S. compliant since day one. The Mirafiori evolution is providing a level of modularity that gives a phenomenal range of applications, from a classic B-segment [model] to the lower limit of the C-segment. It is also all-wheel-drive capable, but this does not mean that all vehicles built in Mirafiori will be awd. In addition, this architecture now can accommodate American powertrains, which was our big stumbling block. In 2013, Chrysler will introduce a nine-speed front-wheel-drive automatic transmission. We updated Small Wide to house this new nine-speed together with American-sized four-cylinder gasoline engines, which also will be made in Europe. Thus the updated architecture is now able to carry the complete range of powertrains, both from Europe and the U.S.
Could Mirafiori build a larger model to replace the Jeep Patriot and Compass? If Mirafiori builds the abovementioned Jeep, could it also make a similar-sized Alfa CUV? No. There will be only one Alfa nameplate coming out of Mirafiori [a subcompact-sized five-door model bound for the U.S.]. We have a solution to the Alfa CUV because the Jeep Liberty/Cherokee replacement in the U.S. is fully industrialized and the plant also has room for Alfa. When will it be possible for other Fiat-Chrysler plants to make cars using the Small Wide architecture? It is perfect for the new plant we are building in Pernambuco, Brazil. Over time, it will also underpin our future models built in India. These developments are not inconsequential, because they effectively link a variety of plants and developments, which ultimately will get us to this magic number of more than a million vehicles per architecture. The Lancia Musa small minivan is quite successful. Will there be a replacement coming out for it from the Fiat L0? Not now, because the L0 visually links with the [Fiat] 500. That styling wouldn't be fitting for Lancia. Nevertheless, it would be possible to also have a Musa replacement off the new architecture that we are installing in Mirafiori. Will Lancia add a sedan variant to join the cabriolet version of the new Flavia? Not until I can find a miraculous way to install a diesel engine into the sedan without spending money. Will Lancia's lineup in Europe feature rebadged versions of all future North America-built Chrysler models? I certainly will look at Europe as a potential market for anything we make in the U.S., but we need to be clear: We can't just keep on dumping products into Europe on the assumption that American conditions will govern. We are going into production next summer with a hugely revised Fiat version of a new Dodge compact sedan. We are importing the 500 from Mexico and next year will add the Freemont. The original plan was to go into Russia with the Fiat brand. I am not sure this is true anymore. More than likely, Jeep will lead the introduction into Russia. Only Jeep, or also Alfa? Jeep first, Alfa second. It's highly unlikely that Fiat [brand] will be brought in except for the 500 as an import in the brand-within-the-brand strategy discussed before. Fiat's share price has halved since the beginning of the year. Why? Everybody has been whacked. We have been whacked by an additional amount. I don't know whether it is because we are Italian or otherwise. Fiat owns 90 percent of Ferrari and has always said it would never have less than 51 percent of the supercar maker. Is the extra 39 percent a parachute that could come in handy in the event of another crisis? It's a parachute. I think we know that it exists. Renault's market capitalization is below the value of its 44 percent stake in Nissan. You once said Ferrari could be worth 5 billion euros and today the share is nearing Fiat's market capitalization as whole. What is happening? Financial markets are very volatile lately, so you should adjust such assumptions on a daily basis, but even 6 billion euros for Ferrari is not an outrageous number. Everything you do in Italy and for Italy seems to receive more criticism than praise. Why? I have asked myself that question a number of times, and I am sufficiently clinical on the analysis as to whether the issue is between me and Italy or whether it is between Fiat and Italy. I think that something was never made right in terms of the history between Fiat and Italy. I may not have helped, but the history is not a good history. Why isn't the history good? Fiat undoubtedly played an incredibly relevant role in the way that Italy developed, but there is a level of suspicion about Fiat in Italy that I think is totally unjustified. And it certainly doesn't reflect what has been done in the last eight years since I have been here. I pass no judgment on what happened prior, simply because I don't know. And whatever I know is incomplete and therefore inaccurate. Do you think the treatment Fiat is receiving lately in Italy is unfair? I think what is very unfair is the continuous dragging of alleged benefits that Fiat received in its history as a reminder of a debt or obligation that this house has toward Italy. That is like being reminded of the fact that your father owed money to everybody. And after your father passed away and you have settled all his debts, a number of people come back and remind you that they helped your father 50, 100 years ago. First of all, you sit back and you look at them, because that was 50 or 100 years ago. Secondly, that guy is dead. Thirdly, people forget that this company was almost dead in 2004. We survived the event -- we are still here -- on our own strength. I am not sure this fact made everybody happy -- for whatever crazy reason.